Kudos to you Carroll!!! Thats great to hear! Helen “Nellie” Fitzpatrick is a member of both the Philadelphia District Attorney’s office and the city’s LGBT community — and in her new position will be working to open the lines of communication between the two. The DA’s office announced last week that Fitzgerald will serve as the office’s first LGBT liaison. Fitzpatrick, 31, came to the city in 2008 from her native Florida to work as an assistant district attorney in the Philadelphia Municipal Court division and later moved to the Family Violence and Sexual Assault Unit. A 2002 graduate of the University of Florida, Fitzpatrick earned her law degree from the Florida Coastal School of Law in 2008. While she had an initial goal of working in the legal area of the music industry, her focus shifted in part because of her active involvement in the LGBT community. Since joining the DA’s office, Fitzpatrick said she has been open about her sexual orientation and vocal about the unmet needs of LGBT victims, serving as an unofficial clearinghouse for other ADAs working with such clients. “If someone has a victim that they’re able to determine is a member of the community, they have come to me asking if there’s anything they should be doing, anything they should be keeping in mind. There have been cases where a victim has not wanted to participate in the process because of fears, and I’ve gone and talked to them,” she said. While many LGBT victims may have concerns over working with the system, efforts to allay those fears have been challenging, Fitzpatrick said, partially because of the inherent difficulty in identifying LGBT victims. Good news here. With all the news coming out of Philadelphia lately, specifically the violence...it's just a matter of time before the GLBT community gets hit...hard. Maybe this appointment will serve as a warning to some of the neanderthal types there to watch their step before thinking of committing violence against LGBT people. 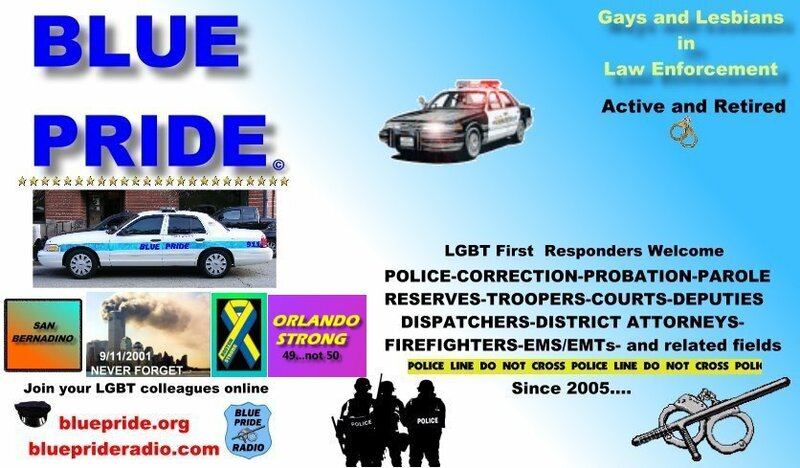 It's a shame that after all the work we did back in 1999-2000, the Philadelphia chapter of the Gay Officers Action Leagaue folded. Keeping it alive required lots of ongoing hard work, but nobodoy really wanted to do it. What a shame. Still, it's good to see that today there is new blood in Philadelphia ready to nake a difference in our community. I wish the liaison good luck. I hear you mention that a lot of work went into helping organize a GOAL chapter up there, but it has folded. I'm surprised, since I have seen and read several articles about how gay friendly and supportive that Philadelphia is. Has all this been hype, hoping to make it such? Ho Hcsodale. It's a pretty long story There used to be a few postings about it here on bluepride, but I could not find them. Here's the very short verson. Back in 1999 or so, an officer named Stephen Galt contacted us in New York to help him to start a chapter of GOAL. I was assigned to help him. On the day we were supposed to meet, he comitted suicide. Later, I met with other Philly cops and set up an executive board. The bottom line is that some of them were only interested in promoting their own interests and others simply did not want to do the work needed to support the chapter. At the time, I was serving as their vice president. My hubby and I were in the process of mooving to Florida, so I had to leave. The chapter folded within weeks of my leaving becuse of apathy and a real case of lazyness. Homophobia didn't cause their demise, their lack of motivation did it for them. Edmontongreg, you may be right. But as long as we are being bullied in schools, denied the right to marry, marginalized and devalued by society at large, forbidden to adopt children and are exposed to a million other insults that make us second class citizens, that cup will remain intact. I do believe that one day it will spill over blending us with the rest of society, but that will only happen when we work to make it happen. Is this the right thread for the kids dying because of bullying? We have to do more, the Trevor Project and Ben Cohen's organization are a start. If we as adult members of the community could start reaching out, we may stop this. You might want to look up the Bullying, Bashing & Crimes Against GLBT People section in the General area. A new police official has stepped up to take on the department’s LGBT liaison position. Deputy Commissioner Kevin Bethel was last week named the LGBT liaison, taking over for recently retired Dep. Comm. Steven Johnson, who held the role for about two years. Bethel, 49, has been on the force for 26 years. The married father of three is a native of West Philadelphia and currently lives in Mount Airy. He holds a master’s in public safety from St. Joseph’s University and a bachelor’s in criminal justice from Chestnut Hill College. Bethel most recently served as Deputy Commissioner of Regional Operations Command South but, amid the department’s sea change earlier this month, was assigned to Deputy Commissioner of Patrol Operations. He said his new role made him a good candidate to take on the liaison position, for which he volunteered. Bethel, who also serves as a liaison for the Police District Advisory Council, attained the rank of deputy commissioner in 2008, after a career that included posts as captain of the 17th District; as a lieutenant in the 18th District, in Internal Affairs and in the Narcotics Intelligence Investigative Unit; as a sergeant in the 17th and in the Narcotics Strike Force and Field Unit in the Special Investigative Bureau; and as an officer in the 6th District, which includes the Gayborhood. The Philadelphia Police LGBT Liaison Committee hosted its second meeting of the year March 14 at the William Way LGBT Community Center to discuss everything from its organizational structure to recent crime statistics and LGBT hate-crimes legislation, with special guest Police Commissioner Charles Ramsey on hand. Price said the committee meets with the commissioner a few times a year to update him on the latest happenings within the LGBT community. “We basically we want to see if there is anything we could do for him or anything that we should bring to his attention, such as sensitivity training and diversity training and topics like that, because he is the one that has a final say in all of that,” Price said. The committee reviewed organizational changes it developed during its February retreat, which includes the launch of four subcommittees: governance, communication and media relations, outreach and events and training and speakers bureau. The organization also reworked its mission and further fleshed out its goals. The group also looked at recent crime statistics in the Sixth District and discussed the need for residents to be more vigilant with locking their properties. Officer Joe Ferraro said there have been multiple burglaries within the district and stressed the importance of locked doors. “If you live in an apartment building, make sure it is secure at the front door, because once they get inside of your building, [the police] are hard-pressed to get inside,” he said. Ferraro said police were sent out to see how many buildings they could gain access to in the area, with officers breaching 20 different buildings. Although there has been an influx of burglaries in the area, officers have been able to lift prints from many scenes, Ferraro added. Bike thefts have also been an issue, and officers have been able to catch career criminals by implementing a number of bike set-ups. Officer Robert Ryan told the committee about the officer recruitment that started running this month, adding he hopes to engage interest from the LGBT community. The first week of the recruitment campaign garnered interest from 400 possible applicants. Ryan said the department had its first-ever out transgender applicant last year and worked with Gloria Casarez, director of the city’s Office of LGBT Affairs, to ensure the individual felt comfortable throughout the application process. Committee member and District Attorney’s Office LGBT liaison Nellie Fitzpatrick said the committee is looking into moving up its LGBT sensitivity training to before the police cadets complete their training process, and hopes to create a video presentation to be shown to current officers at roll call.